My recent visit to Mysore made me to explore some popular dishes from Karnataka and its coastal region. 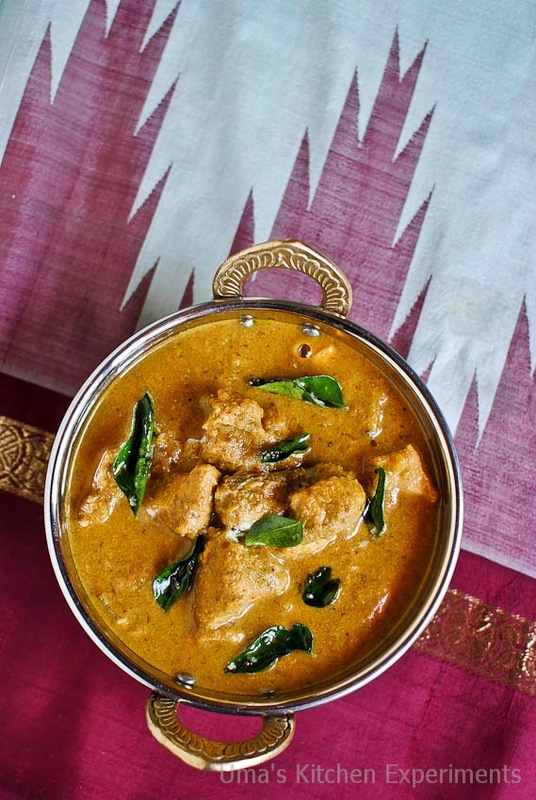 When I read articles on Mangalorean cuisine, I stumbled upon this Chicken Curry - Kori Gasshi. Kori - Chicken and Gasshi - Spicy gravy based on thick coconut. 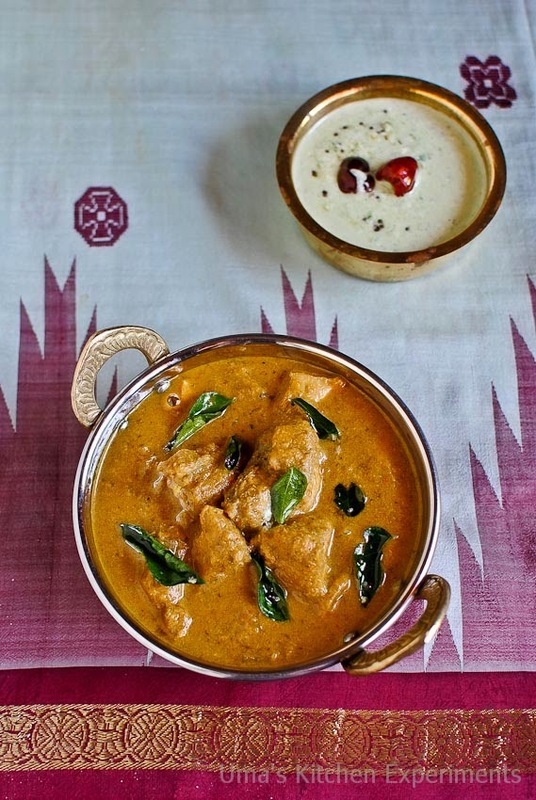 When I read this recipe in an online site, I quickly recollected a similar dish from the cookbook - 50 great curries of India which was lying quietly in my shelf for sometime . 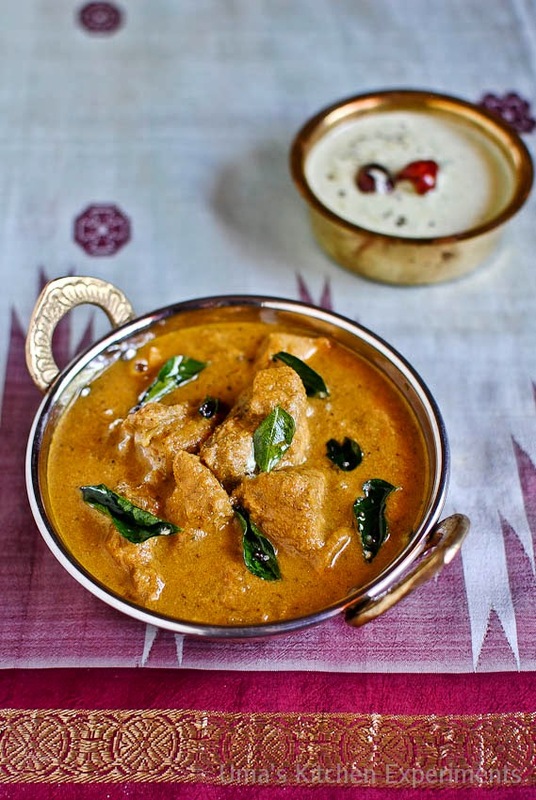 This chicken gravy / curry is a bit unusual as it makes use of very hot red chillies, tamarind and few of rare spices which are not normally used in other chicken dishes. Overall, the dish was rich, hot and tasty. 1) Soak 3/4 cup of coconut in 3/4 cup of warm water for 30 minutes and after 30 minutes, blend, extract the first milk from it. Add 2 cups of water and blend again. Then extract the coconut milk once more. 2) Keep both coconut milk aside (separately) till you prepare the gravy. 1) Add 1 teaspoon of oil in a pan. Add grated coconut and roast till it becomes to nice brown colour. It will take about 4-5 minutes. Transfer to a plate once done. 2) To the same pan, add another teaspoon of oil. Roast coriander seeds and dry red chilli. When both are almost roasted, add rest of the ingredients(cumin seeds, Mustard seeds, fenugreek seeds, cinnamon stick, black pepper and cloves) one by one and roast it again. Stir continuously to avoid burning. 3) When all the ingredients are roasted well, turn off the heat and add turmeric powder. Mix it well. The heat in the pan is sufficient for the turmeric powder. 4) Transfer to a plate and allow the ingredients to cool to room temperature. 5) Meanwhile, soak tamarind in 1/4 cup of water. 6) Chop onion, ginger and garlic. 7) By now, the roasted ingredients would have cooled well. 8) Add everything to a mixie jar or blender and make a paste out of it. Add 1/4-1/2 cup of the coconut milk (extracted second time) to help in grinding process. It will take 5 minutes approx. to get the desired consistency. 9) Keep this paste aside. 1) Heat 3 tablespoons of oil in a pan. 2) Add finely chopped onion and saute till it becomes soft and translucent. It will take 5-7 minutes. 3) Add the ground paste. Mix well. Use little quantity of water to rinse the mixie jar and pour it to the pan. Saute and let it cook for 3 minutes. 4) Add the chicken pieces. Saute for 2 minutes and pour the remaining coconut milk and salt to taste. Add 1/2 cup of water and mix again. Allow the dish to cook in low flame till the chicken is almost done. 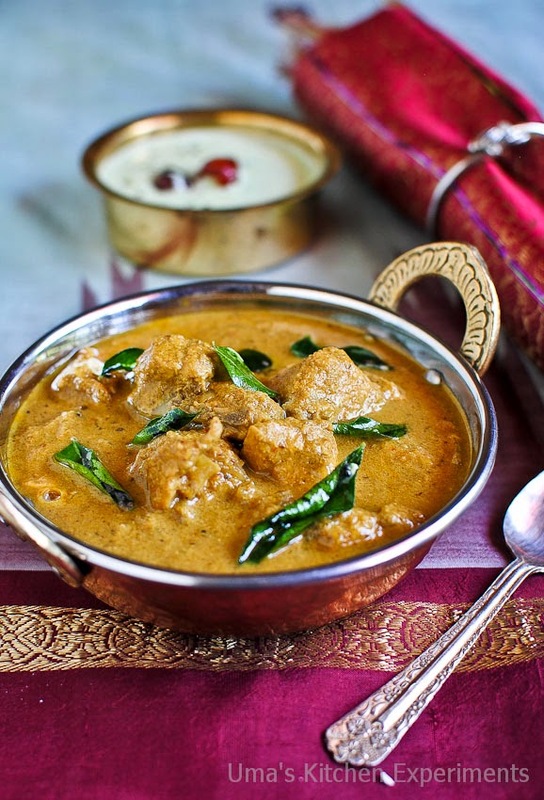 5) When the chicken is almost down, add the coconut milk (first extracted milk) and a spring of curry leaves. 6) Just boil it for 1 minute and turn the flame off. I garnished it with the a spring of fried curry leaves. 7) Serve hot with rice or roti. 1) I used 5 small but very spicy variety of chilli for making this gravy. Original and authentic recipe uses Bedgi chilles which look like kashmiri chillies that provide bright red colour and also taste very hot and spicy. Since I don't have them at stock, I used normal chillies. So, adjust the red chilli quantity as per your taste. 2) The colour of the gravy depends upon the red chilli you use. 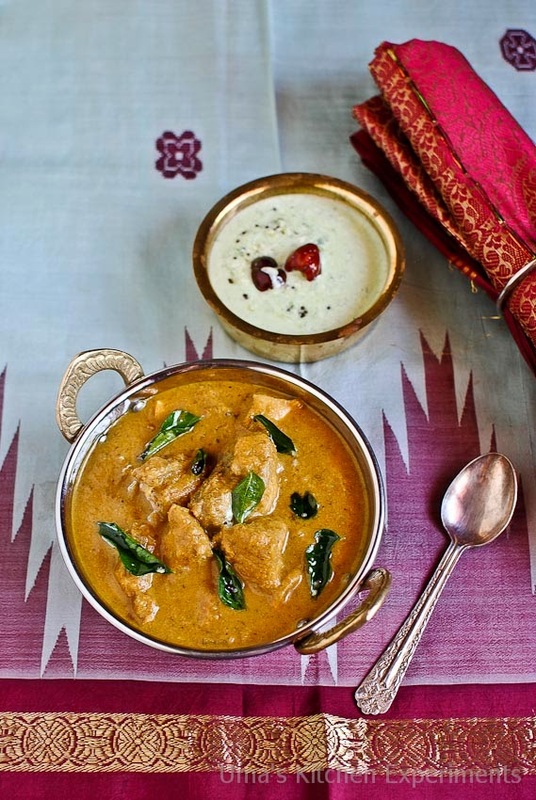 Super rich looking chicken curry, just need some rotis to enjoy with this fingerlicking curry. wow!!! wow!! awesome pictures dear!! luk so yumm and delicious! mouthwatering chicken curry. Looks super delicious. the curry looks really so good... some rotis and i am done! thou m not a non veg eater.. i still love the use of old n classy silk saree u hv used.. grt click..
Good thing that u tried and discovered these coastal karnataka cuisine....and also the way u presented... keep going Ma'am:) All my wishes.. The best display of a recipe ever. Simply perfect with steps and pictures like a through professional. You must be an amazing girl and you are not even Mangalorean!! Thank You for visiting my space and leaving your comments.Your thoughts/feedbacks/perceptions are important to me to do something better! Keep Visiting!